If you need your tennis court or recreational surface to stand up to the elements and stand out for its style, you need All Pro Courts. Since 1988, we've been constructing and maintaining the best surfaces in Maryland, lower Pennsylvania, Delaware, New Jersey and Virginia. We are dedicated to our customers and don’t consider our work complete until they are satisfied. 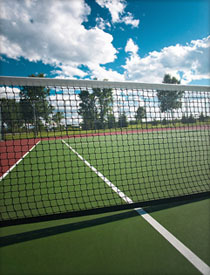 Whether you need a surface for a country club, parks and recreation facility or your own home, All Pro Courts is the company that will meet all your needs. Feel free to browse our website and visit our services page to find out more about our company and how we can serve you. Or, give us a call at 1-800-434-3658.